The former Marine believed to have killed his ex-wife and five of her family members and seriously stabbed another was found dead in the woods near his Montgomery County home Tuesday, after apparently killing himself with a knife, authorities say. Bradley Stone appears to have killed himself with “self-inflicted cutting wounds to the center of his body," Montgomery County District Attorney Risa Vetri Ferman said. A knife was found nearby, she said. The body of the shooting spree suspect Brad Stone was found in a wooded area not far from his Bucks County home. Stone died of a self-inflicted stab wound after killing 6 people and seriously wounding another. District Attorney Risa Vetri Ferman confirmed that there were a number of court battles over the custody of the two children of Nicole Hill Stone and her ex-husband Brad Stone. NBC10's Deanna Durante just spoke to investigators. She has the latest. Stone's body was found at 1:38 p.m. near West 4th Street and Schoolhouse Road North Hanover Township, Vetri Ferman said. That is about a half mile from his home, where SWAT teams had been methodically searching for him for the past two days. Police also found a video recorded by Stone on a cellphone on or near his body, law enforcement sources said. Stone, 35, had not been seen since just before 5 a.m. Monday as he rushed his screaming children out of their mother's apartment in Harleysville. Moments before, neighbors and police said he gunned down the woman, Nicole Hill Stone. She was the last of seven family members he shot or stabbed that morning, prosecutors said. The children were left in his neighborhood in Pennsburg, and he fled, officials said. The girls, along with Stone's current wife and child, are now in protective custody, Vetri Ferman said. Newly released search warrants offered more detail into how the victims were fatally wounded. Stone Hill was shot in the face and head, according to the documents. Her mother Jo Anne Koder was shot and cut in the neck, and her grandmother Patricia Hill was shot in the arm and head. Stone Hill's sister Trish Flick was shot in the face and cut, brother-in-law Aaron Flick was shot in the head and hands; and 14-year-old niece Nina died of cutting wounds. State police block off Schoolhouse Road in Pennsburg on Dec. 16 after police discover the body, sources say, of Bradley Stone. The 35-year-old was wanted for the shootings of his ex-wife and six family members. Autopsies were being conducted to determine official causes of death, the DA said. The lone survivor is Stone Hill's 17-year-old nephew, Anthony Flick, who officials believe tried to fight off the attack. He suffered a "gaping skull fracture" and lacerations to his arms and fingers, according to court documents. Despite being left injured in his Souderton home for some time as police worked to determine whether it were safe to enter, the teen survived. He remains in serious but stable condition and is surrounded by family at Thomas Jefferson University Hospital in Philadelphia, the DA said. Friends tell NBC10 he is expected to recover. "We are gonna be here for him," friend and former eighth-grade sweetheart Sarah Sewell said. "We are his family now, because that is all he has left is us. We are going to be his family." A GoFundMe account, Funds for Flick, was set up to help assist with Anthony's medical bills and has raised more than $8,500 in nearly a day. The Souderton-Telford Rotary also announced plans to set up a fund for Stone's children. 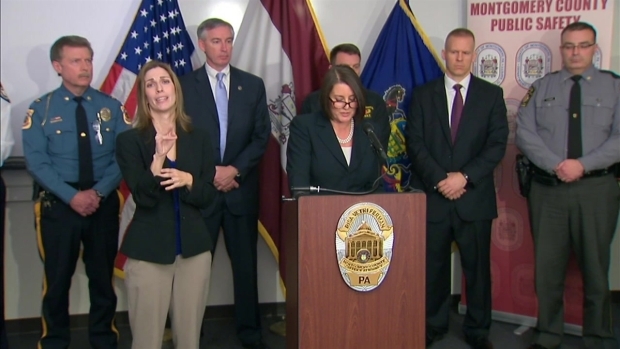 Montgomery County District Attorney Risa Vetri Ferman outlines how each of Brad Stone's victims died and how the lone survivor, a 17-year-old teen, was gravely injured. Stone served eight years in the U.S. Marine Corps Reserve and was briefly deployed to Iraq in 2008. Fellow Marines who served with him described the man as odd and said that he had a tumultuous relationship with his ex-wife. Hill Stone's neighbors and friends told NBC10 the woman warned Stone would kill her and they pointed to the couple's bitter custody dispute as motive for the killings. Prosecutors, however, have not released an official motive. "We can speculate why. I could look at some of the court filings and say he wasn't getting his way and he was dissatisfied with that, but there's no excuse. There's no valid explanation. There's no excuse for snuffing out these six innocent lives and then injuring another child," Vetri Ferman said. The two day manhunt for Stone sent eight SWAT teams rolling through at least four Montgomery County towns in assault gear and military-grade vehicles. They lobbed gas canisters and flash bangs into homes and searched neighborhoods and the woods. Federal agencies and police in other counties assisted in the search, schools were closed and neighbors spoke of the fear they were feeling. A supposed sighting of a man who fit Stone's description involved in an attempted carjacking in Doylestown Monday night prompted lockdowns and shelter-in-place orders. In the end that report "did not appear to be valid," Vetri Ferman said. The district attorney thanked the public for their assistance and patience. "This is just a horrific tragedy that our community has had to endure," she said. "I think we're really numb from what we had to go through over the past two days." Bradley Stone (pictured left) is suspected in the shooting deaths of six people, including his ex-wife Nicole Hill (pictured right), the Montgomery County District Attorney said. He was found dead on Tuesday. Vetri Ferman could not say how long Stone's body was in the woods and when he might have died. She deferred to the coroner who picked up the man's body Tuesday evening and will determine a manner of death.